Gratin dauphinois, aka pommes de terre dauphinoise, aka potatoes à la dauphinoise, aka gratin de pommes à la dauphinoise, aka Best Potato Dauphinoise by AlmazanKitchen. 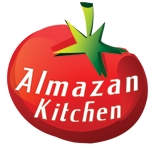 Traditional French dish based on potatoes and cream prepared with passion and love of AlmazanKitchen crew. Crispy & creamy organic potatoes baked in a special clay cookware on coals with a huge dose of homemade cheese! Slice 500g of organic potatoes. Grate 200g of homemade cheese. Unpeel and smash 3 big garlic cloves then chop well. Put it into the bowl. Add 1 tsp. of salt & pepper and 1 cup of cream. Preheat and oil up the clayware pot. Make the 3 layers of the sequence: potatoes, cheese and cream. Cover with lid and cook until ready. You guys are absolutely awesome. I have watched every video of yours I can find. Many of them several times. Never, never, never stop and thank you. Hello there friend! Thank you for following our channel! We’re glad you like what we do that much, it means really a lot! Cheers!